They say that necessity is the mother of invention. Regi Abraham must have thought about this when he started his Bangalore-based business, Mountain Herbs, dedicated to the creation of gentle, all-natural body care products. After getting laid off from his high profile corporate job as finance head of software firm, Regi joined a NGO which was run by a friend. Few years into the new assignment, the funding dried up for the NGO and Regi’s job was reduced to a part time gig, bringing him back to the drawing board and leaving him ample time to follow other pursuits. This is when he decided to follow his entrepreneurship call and start a home based small business with a purpose to make a difference. His passion for natural products led him to doing research to make his own soap and other body wash products, both free from harsh chemicals and animal products. He started out making soap in his own kitchen in a small scale. The initial investment available was just enough for buying a stainless steel mixing kettle, few large plastic jars and the two basic ingredients needed for soapmaking–oils and sodium hydroxide. In addition to creating his own product line and designing his products’ packaging, Regi also designed and built own sealing machine and cutting machine along with jigs to automate part of the soap making and packaging process. The low initial start-up investment was counterbalanced by the immense amount of time ,labor and love that went into creating a body-care product line. Regi spent three years testing soap recipes, researching government requirements, creating and fine tuning the formula for the soap with the right consistency and quality, designing and packaging. The kerala native knew from the beginning that he wanted to create a soap that was gentle, pure, and free from chemicals and animal products. “There’s no reason for there to be harsh chemicals and animal products in soaps and shampoos,” says Regi. These chemicals leach into our body through the skin and over a long term can cause immense harm. He can count numerous examples of customers reporting significant decrease in skin ailments, regeneration of scalp hair and other curative benefits, even though the soaps are not meant to be medicinal in nature, but just a natural and pure alternative to the chemicals laced commercial products. 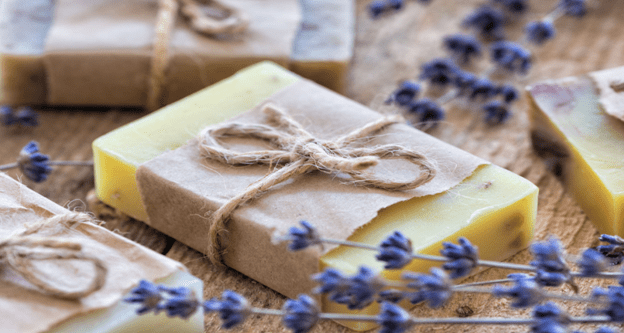 Regi is excited about the future and sees an immense opportunity to cater to the segment of the market which is looking for a pure and natural option for body wash products. Mountain Herbs journey so far can be summarised with the review comments of one of his Amazon customer. “What Mountain Herbs is doing is amazing. Allowing conscious consumer access to 100% Natural products. I have used the hand wash and laundry liquid and find both to be excellent in quality and aroma. The products work well and the clothes are coming out washed fresh at the same time keeping our skin and the environment healthy. Thank you, Mountain Herbs”.